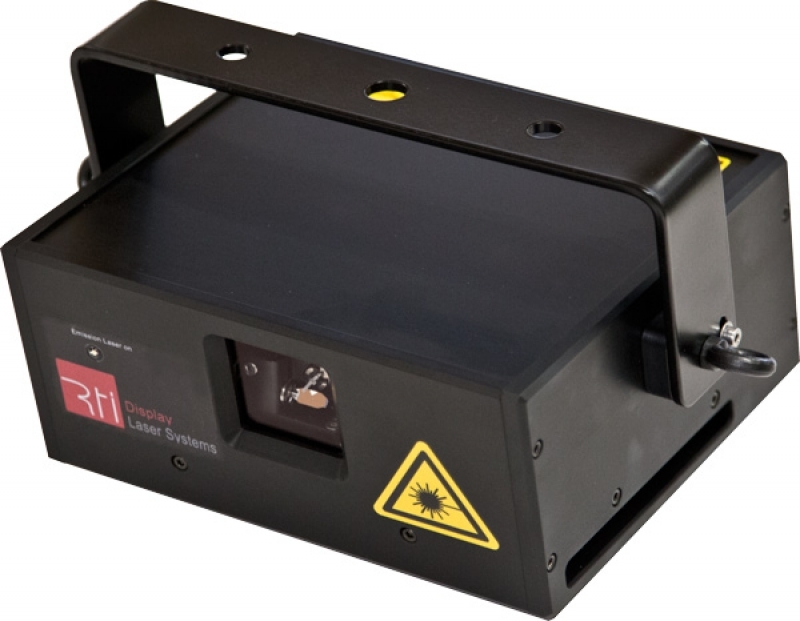 The RTI ATTO RGB 1.7 is an ultra-compact full color whitelight laser system with all diode laser sources never before seen at this price point in the RTI range of products. With dimensions of only 20 x 20 x 10 cm this professional complete laser system is so small that it can fit into hand luggage on a flight! 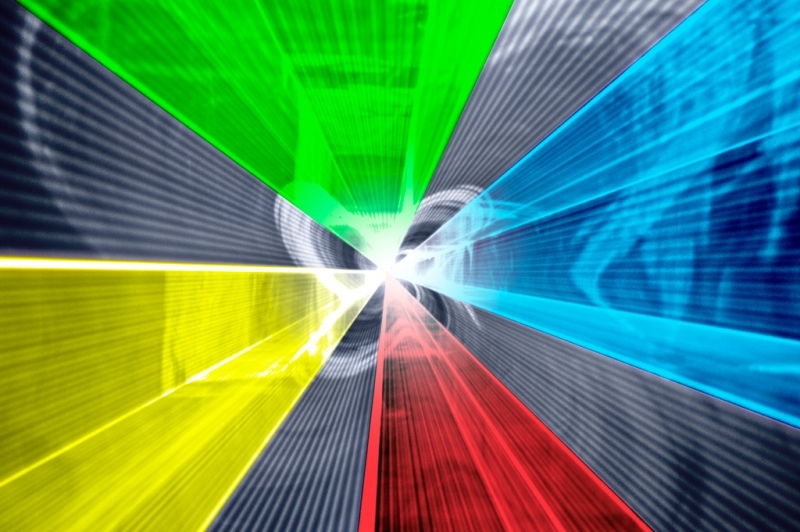 The guaranteed power at aperture (after output window) is 1600mW with typical power output up to 1900mW. With this system being a diode only solution the beam specifications are excellent with a beam diameter of only 3mm and a divergence below 0.8mrad at full angle! Together with the extremely fast scanners of 45kpps at 8° this makes the ATTO perfect for a wide variety of applications through beams or graphics. The excellent low divergence means brighter beams over longer distances and due the the ATTO being equipped with the very bright 638nm red (>300mW) and high visibility royal blue at 450nm (>1.200mW) with the new special green diode source of 520nm diodes (>240mW), means a vast array of beautiful colors with high definition. As a diode only solution, the ATTO takes advantage of the linear fading and great color stability of semiconductor laser sources, which is required for many professional applications including TV production. For colour balancing and scanner adjustments the ATTO is equipped with trim pots at the rear of the housing: Three trim pots are specified for colour intensity adjustments – red, green and blue, two controls the X and Y gain of the scanners and another two trim pots control the X and Y offset of the scanned image giving great control and extra safety features external of software control. The RTI ATTO does not need an additional power supply as it’s already integrated into the system which makes an excellent touring option which is especially suitable for rental companies or mobile use. 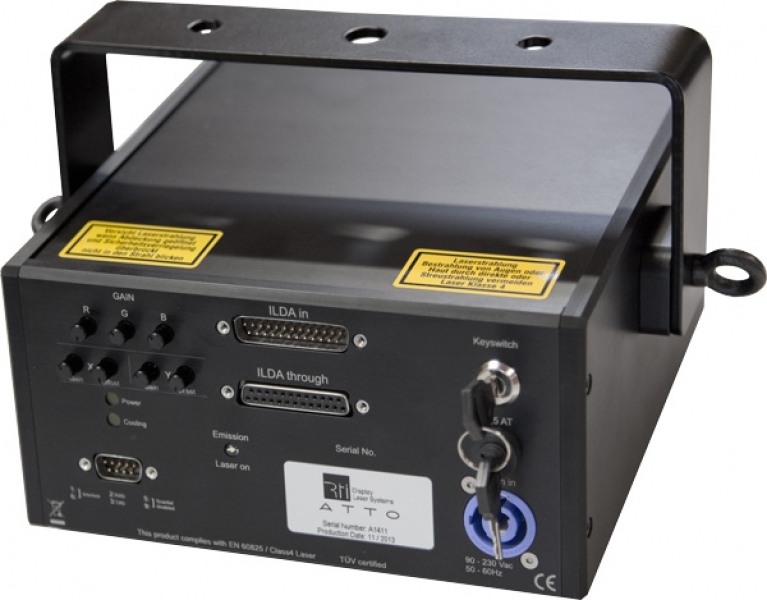 The RTI ATTO complies with the European and U.S. safety standards, it is equipped with a 9-pin SubD standard interlock connector and a safety key switch including the whole system having advanced scan fail safety for additional laser scan safety features. The RTI ATTO as standard comes with ILDA interface for professional computer control with external devices like network interfaces or standalone controller which are available on request. 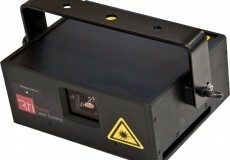 It is also possible to have CT-6210HP scanners as an upgrade option with every ATTO system.